I’m writing this in the dark because the power is out in our hostel. Kashgar, in the far northwest of China. 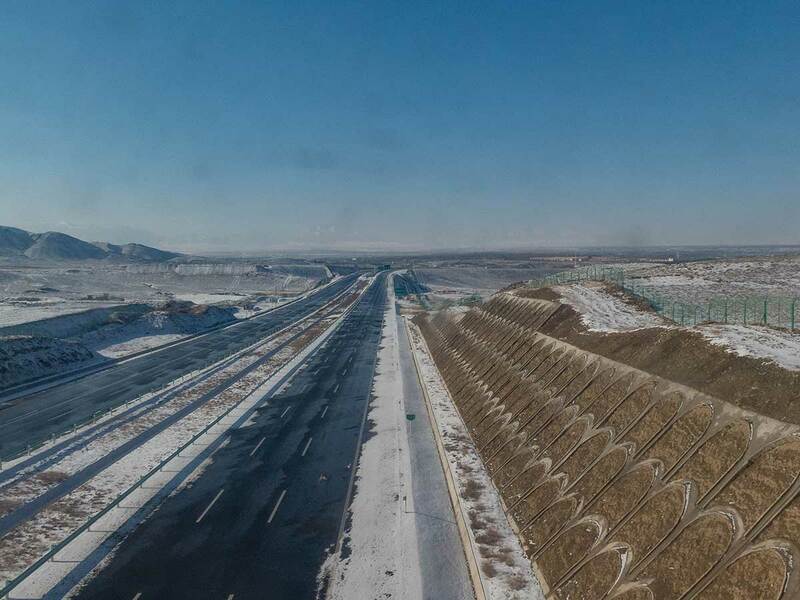 This is where the Chinese train line ends, less than 200 kilometres from the Tajik and Kyrgyz borders, 300 or so from Afghanistan and Kashmir. Outside our hostel it looks more like Cairo than Beijing, with its Moorish arches, minarets and long narrow windows. The old men wear wispy beards and skullcaps, most of the women wear headscarves and the number-one food is kebab. In the rest of China, convenience stores basically double as liquor stores, but here it’s hard to find a drop outside your hotel. The only clear sign you’re in China is the Chinese script on the shopfronts (underneath the Uighur, written in Arabic script), and the odd Chinese tourist, looking as lost as we are. Jo and I have done the boomerang through China like an inverted Nike Swoosh. From Kunming it was the hard sleeper train to Nanning—the hard sleeper not being terribly hard if you’ve done this before, with two triple bunks facing each other, lots of snoring, lots of people looking at you funny and wondering what in the world you’re doing here. From Nanning, we stuck with China’s mind-blowing bullet trains until we reached the coast. The country has put a lot of money and effort into expanding its high-speed rail, and the results are awesome. Bullet trains whisk travellers, crammed into tiny rows of three and two, along at 350 kilometres per hour across the provinces. This is one part of China where they actually enforce “No Smoking” rules, and they have to remind everyone at every stop not to get off if it isn’t your stop, or the train will leave without you. 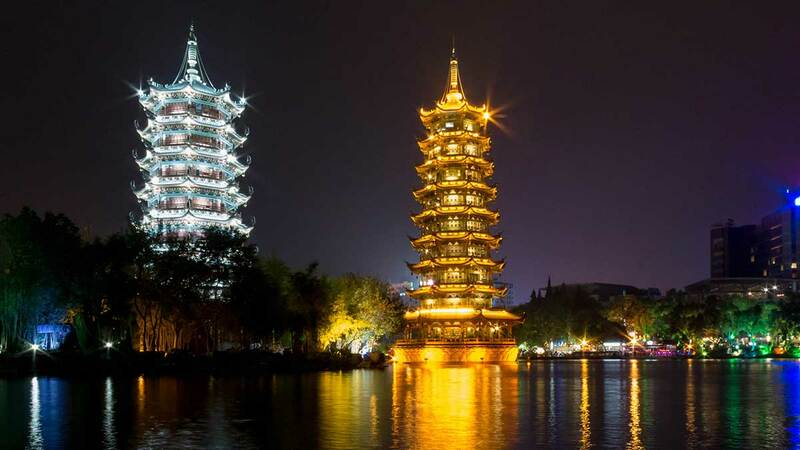 First we stopped in Guilin, a small city in Guangsi surrounded by karsts, sitting on two lakes and four rivers, lit up at night like a small Asian Paris. I learned here that donkey is delicious, especially when baked in pastry. 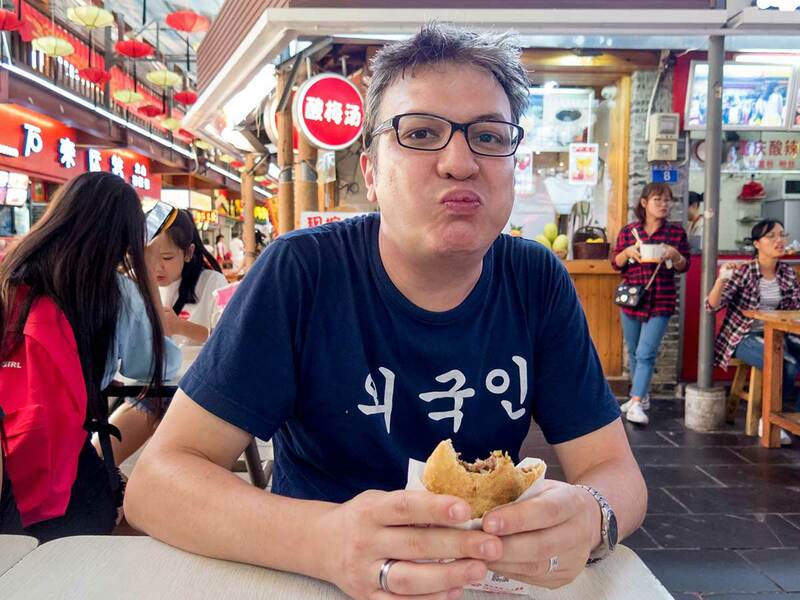 The author chomping down on some donkey meat in Guilin, China. Next it was Changsha, capital of Hubei, Mao Zedong’s home province, and allegedly the city where he discovered communism. 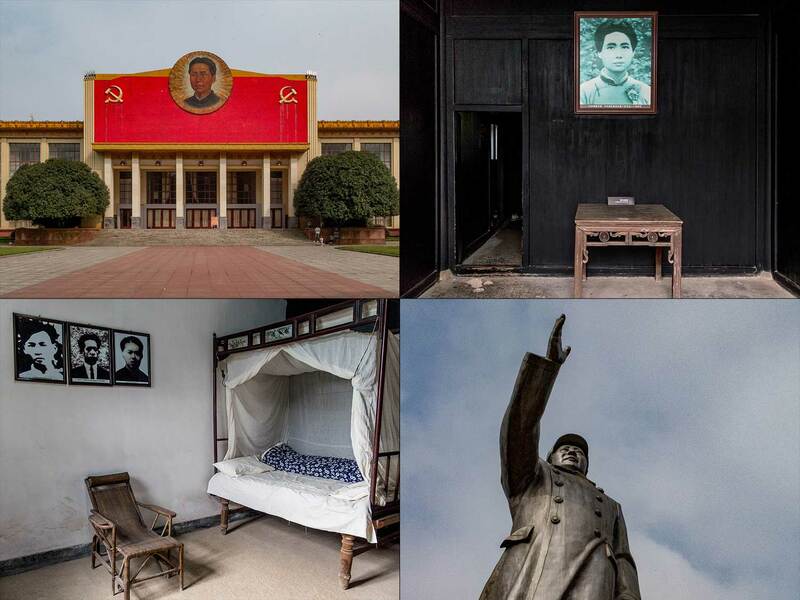 They take their Mao seriously here—you can visit his home from the 1920s, buy T-shirts emblazoned with the Chairman’s face and gaze at his smiling countenance from dozens of places. But the Mao Zedong pièce de résistance is undoubtedly “Young Mao,” a 32-metre-high sculpture of his head, locks flowing like those of a young Elvis, eyes focused steely on China’s glorious socialist future. It’s so huge that from the banks of the Xiang River, you can still make him out clearly, even though the smog in this city could kill pigeons. Opposite him, couples learn to square dance. 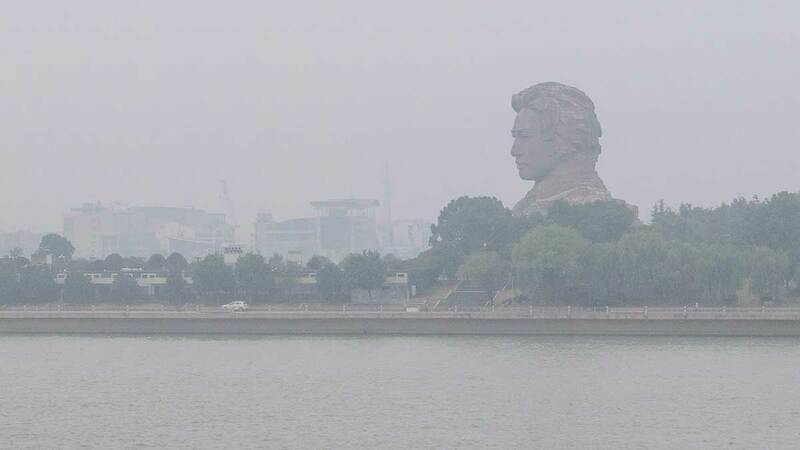 Travellers can see the 32-foot-tall Young Mao statue from miles away—despite the haze. Another bullet to Xiamen, another to Suzhou—and then it was time for the monster: Train Z40 from Shanghai to Urumqi, capital of northwest Xingjian province. At 39 hours, this is one of the longest nonstop train trips in China. We were running out of visa time, having wasted it all in the south, and now it was time to make up for it. We chose the soft sleeper this time around—a wonderful decision I will never regret, no matter what my bank balance says. Four comfy beds in a private room, headroom, consistent hot water, meals straight to your cabin, electrical outlets and—O Holy of Holies!—a sit-down toilet at the end of the car. On the last day of the trip, we woke up to desert and snow, proof we were in Xingjian. It had only been a week earlier we had been in shorts and sandals on the Fujian beach, and now temperatures were sub-zero. The landscape was mostly barren, with a few grassy outcrops, every so often a gasworks or small mining town. But then a range of mountains would appear, some snow-capped, some bare, some with Bactrian camels peering up among them. This was a whole new China for us. Guilin, China, lit up at night. Like the south of Thailand, we had been warned off Xingjian; like with Thailand, we ignored it. No tourist has ever been harmed here by political violence, and we had little reason to believe we’d be the first. 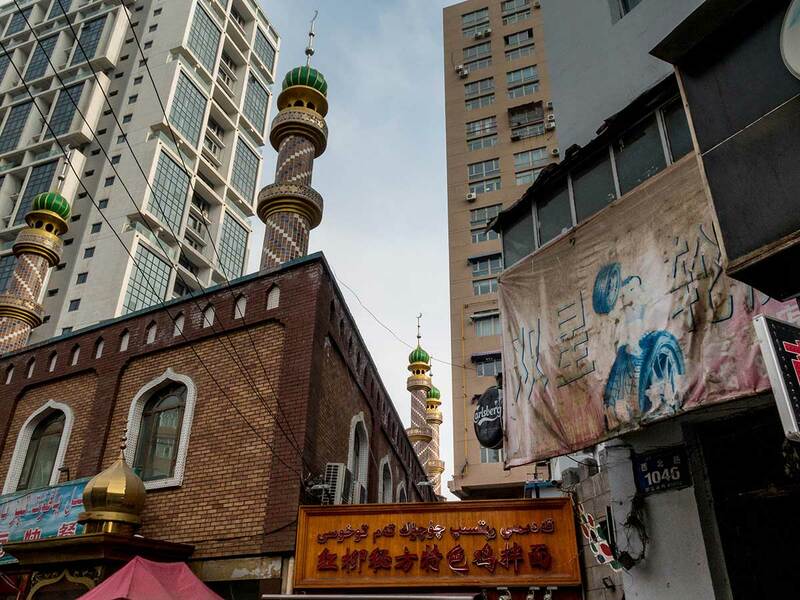 But there is a feeling of tension, especially in Urumqi, where violence occasionally flares up between the Muslim Uighur minority, whose language is closer to Turkish, and ethnic Chinese settlers. There are soldiers everywhere, sometimes mounted on half-tracks, sometimes behind netting, always armed and looking very serious—and always ethnic Chinese, never Uighur. A mosque stands tall in Urumqi, the capital of northwest China. Security is tight everywhere—getting on the city bus, I had my water bottles taken from me like on an airplane. (But, oddly, not my booze.) At the train station, packed with weekend travellers, we had to clear three chaotic rounds of body, bag and ID checks. But we did it, and it was the 24-hour hard sleeper from Urumqi to Kashgar, a rocky but jovial trip in a very old locomotive. The Uighur people are nothing if not nice, sharing their bread, trying to learn as much about us as possible and overall being extremely cordial and helpful, if curious as to what we are doing out here, in the Chinese Yukon.